An angry employee opened fire at a western Kentucky plastics plant after an argument early Wednesday, fatally shooting a supervisor and four others before committing suicide, police and a company official said. Twenty-five-year-old Wesley Higdon of Henderson warned his girlfriend two hours before his rampage that he would kill his boss. Authorities say Higdon had an argument with his supervisor about wearing safety goggles Tuesday night, then called his girlfriend and said he was going to kill him. The killings stunned the sleepy Ohio River town of about 28,000 people, where a local leader said many residents know or are related to a worker at the plant. "Our whole community is in shock," Henderson County Judge-Executive Sandy Watkins said. The rampage began shortly after midnight, when Higdon, a press operator, began arguing with a supervisor and was escorted from the building, company CEO Bud Philbrook told The Associated Press. As the employee was leaving, he took out a gun, shot the supervisor, then charged back into a break room and shot several employees. Then he returned to the floor and shot another employee before killing himself, Philbrook said. Between 35 and 40 workers were inside the factory at the time. "It's just total shock. It's something you read about in the paper," Philbrook said. A man who called 911 frantically described the scene to a dispatcher, tallying up the number of dead around him. "There's more than two people dead. There's like one, two, three, four, five people dead," the man said. "The supervisor is dead, too." Officials are trying to determine the nature of the argument the employee had with his supervisor, Philbrook said. "There's certainly no record of untoward activity or performance prior to this situation," he said. It wasn't clear if the employee was carrying the gun, or if he retrieved it after the argument. Under Kentucky law, business owners are allowed to prohibit people from bringing weapons onto the premises. "We don't know if the gun was in the car or if he went somewhere to get it," Henderson police Lt. David Piller told CBS affiliate WLKY-TV. At least one other person was injured, police said. The wounded victim was taken to St. Mary's Hospital and Medical Center in Evansville, Ind., spokeswoman Cheryl Dauble said. That person was in critical care, she said, but declined to release further information. The names of the gunman and the victims were not released. However, Henderson County Coroner Bruce Farmer confirmed the supervisor was among the dead. He said autopsies for all six were planned Wednesday. Four of the victims were members of St. Michael's Catholic Church in Sebree, Ky., said the Rev. Jason McClure, who had spent much of the morning with the victims' families. McClure declined to identify those who were killed, at the request of the Henderson County coroner, but said their families and fellow parishioners were shocked by the shootings. "They are very upset and hurting deeply and just trying to figure out what to do next," McClure said. Hours after the shooting, police had set up a roadblock on the street leading to the plant, which is in an industrial area on the southern side of Henderson. Other employees at the plant were sent home. Atlanta-based Atlantis Plastics has 1,300 employees worldwide, and about 150 in Henderson, where workers make parts for refrigerators and plastic siding for homes. 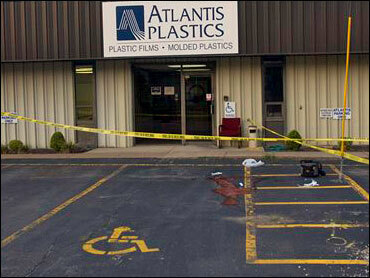 In a news release on the company's Web site, Atlantis Plastics said it is a leading U.S. manufacturer of three kinds of products: polyethylene stretch films for wrapping pallets of materials, custom films for industrial and packaging uses, and molded plastic pieces used in products such as appliances and recreational vehicles. The company has annual sales of $110 million, according to business directory Hoovers.